LAS VEGAS, Nevada – At NAB 2015, HARMAN’s Studer is showcasing an array of world-class solutions designed to streamline workflow, maximize efficiency, and simplify system operation and management. 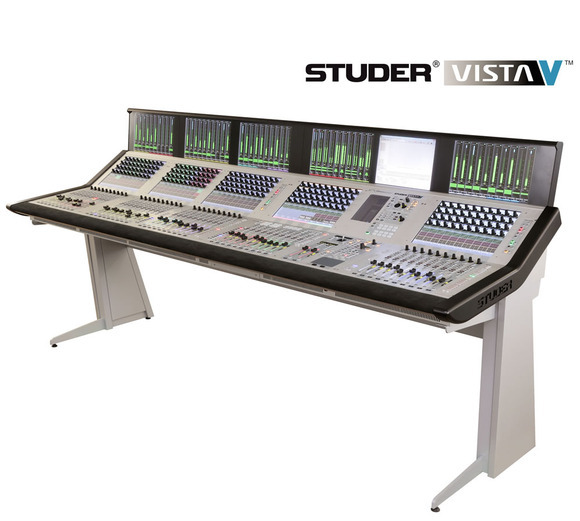 Studer is showing its Vista X and Vista V digital consoles, whose Infinity Core CPU-based processors provide huge numbers of DSP channels for large-scale, high-resolution audio processing and mixing. Infinity Core is truly the first of its kind, providing a scalable system, faster development of new signal processing designs, huge channel counts, full system redundancy without a single point of failure and the possibility of running third-party algorithms. Studer will also show the OnAir 3000 networked radio system running the latest software offering AoIP. Offering a digital audio interface that features higher capacity than any other such product in the industry, Studer is also highlighting A-Link, a fiber-based interface that uses a 3Gb data rate to offer 1,536 audio channels per connection. A-Link technology makes the Infinity processing core possible, by connecting the huge number of audio channels into and out of Infinity Core. A new PCI express card has been designed to fit into the Vista X and Vista V consoles’ server board, and the card is fitted with 12 A-Link interfaces capable of over 10,000 inputs and 10,000 outputs. The A-Link interface also provides direct connection to the Riedel MediorNet distributed router, allowing many Infinity systems to be connected together with router capacities of 10,000 square or more. In addition, Studer is hosting special guest speakers - are leaders in the broadcast industry, who will discuss their experiences and best practices. These include Andy Tapley, Sound Supervisor at t BBC Studios and Post Production, and Brad Duryea, Head of Audio Production at Lakewood Church. BBC Studios and Post Production provides premium studio space and uses Studer technology at its studios at Elstree where Vista X, Infinity Core and OnAir 3000 digital consoles are installed. Tapley will provide an overview of the infrastructure at Elstree and will talk about how the Studer systems are used for the broadcast of shows including Strictly Come Dancing. Lakewood Church has recently added a Studer Vista X digital console, featuring Infinity Core processing technology, for the television broadcasts of its worship services. Duryea will present an in-depth description of the Studer system at Lakewood Church. Senior product staff from Studer and JBL will also present during the week on digital mixing technologies and the new JBL 7 Series studio monitoring system.